The integrated oil major has some inherent advantages over the top independent U.S. driller, but both are benefiting from an industry boom. Three years ago, if you asked me to compare the prospects of an integrated oil major like BP (NYSE:BP) to an independent oil and gas exploration and production company (E&P) like ConocoPhillips (NYSE:COP), I'd have told you the oil major would win hands down. The price of oil had collapsed, and independent drillers were stuck up the proverbial creek without a paddle. The same would've been true even last year, but now, oil prices have finally begun to head north again, and that means that E&Ps -- now benefiting from cost cuts made during the slump -- may once again be able to hold their own against the majors. Let's see if that's the case for ConocoPhillips versus BP. Both BP and ConocoPhillips are top oil and gas industry stocks. Image source: Getty Images. Conoco's fortunes are tied to energy prices. Like all E&Ps, Conoco extracts oil and gas from the ground and sells them on the open market. If the company's extraction costs are low and the sale price is high, Conoco and its investors prosper. On the other hand, if the sale price is only barely above Conoco's extraction cost -- or worse, below it -- the company's in big trouble. That's the situation that led Conoco to slash its dividend by nearly two-thirds in 2016, from $0.74/share to just $0.25/share. Energy prices have an impact on BP, too, which has exploration and production operations of its own. But BP -- as an integrated oil major -- has the luxury of having downstream (refining and marketing) operations that can make money regardless of the price of oil and gas. That downstream business is what allowed BP to muscle its way through the oil price slump without cutting its hefty dividend. BP currently yields 5.6%, much higher than Conoco's lackluster 1.5%. That's not to say that an investment in BP is foolproof. Just ask shareholders who were around in 2010, who saw both BP's stock price and dividend tumble in the wake of the Deepwater Horizon disaster in the Gulf of Mexico. But generally speaking, if oil prices start to plummet again, BP's business model -- not to mention its larger size and investments in renewable energy -- make it a safer place for your money than Conoco. But let's assume that oil and gas prices remain at their current levels, or even increase in the coming years. Both companies should benefit, but which one benefits more? The recent performances of BP and Conoco will give us a pretty good idea of how well they'll perform in the current energy-price environment. And both have been posting stellar numbers recently. In Q2 2018, Conoco's oil and gas production came in at 1.21 million barrels of oil equivalents per day (BOE/d). While that was down from Q1's 1.22 BOE/d, thanks to scheduled maintenance, it was just above the high end of the company's guidance, and represented a 5% year-over-year increase in production. During the quarter, Conoco also acquired some Alaska assets that should boost production in future quarters, as well. That increase in production helped to bring in $3.3 billion in operating cash flow and boosted net earnings to $1.6 billion. Quarterly net earnings in Q2 2017 had been negative, a testament to how much the price of oil factors into the company's success. BP made a sizable acquisition in Q2, as well, winning its bid to acquire Anglo-Australian company BHP Billiton's U.S. shale assets, which includes acreage in the red-hot Permian Basin. That ought to give BP's production a boost, although considering how strong its Q2 2018 numbers were, it scarcely needed one. The company's quarterly production rose 3.3% year over year, to 3.66 million BOE/d. Operating cash flow of $6.3 billion and net earnings of $2.9 billion were up 29% and 1,740% (not a typo), respectively, year over year. Again, those numbers show how much difference the price of oil makes for these companies. Both companies have clear plans to share their successes with shareholders, and both have begun using the cash they're generating to buy back stock and boost their dividends. These numbers are indeed fantastic for both companies. This one's a draw. While both BP's and Conoco's recent numbers are so good that it's hard to pick a winner, there's a way to objectively measure how effectively the management of each company is deploying its cash. We can look at return metrics like Return on Capital Employed (ROCE), Return on Invested Capital (ROIC), and Return on Equity (ROE). 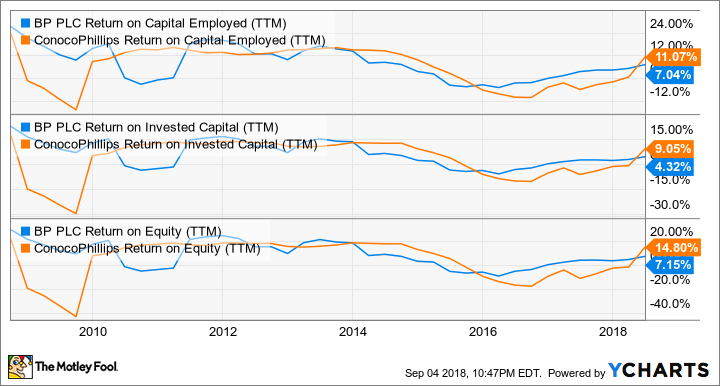 BP Return on Capital Employed (TTM). Data by YCharts. As you can see, the companies' historical performances have been largely similar, with two notable exceptions in 2008-2010, when the Great Recession hit oil drillers like Conoco hard, and in 2010-2012 during the aftermath of BP's Deepwater Horizon disaster in the Gulf of Mexico. Over the last two years, thanks to its larger size and downstream operations, BP generally has posted higher returns than Conoco. Recently, however, Conoco has shot ahead of its larger rival and likely will continue to outperform, as long as oil prices remain high. Whether Conoco or BP is the better buy for you right now is largely going to depend on your investing philosophy. Both are strong companies that are likely to outperform the market for as long as energy prices stay at or above their current levels. If you're a cautious investor, BP is probably the better buy for you. Its current returns may not be as high as Conoco's, but it offers more stability than its smaller rival, a stronger dividend yield, and has its downstream operations to fall back on if the price of oil drops. On the other hand, if you can afford a little more risk, Conoco is probably the better buy for you, thanks to its higher returns and outstanding performance. If oil prices drop, however, Conoco and its shareholders may be left in the lurch (again). If I had to make the call, I'd stick with BP.